Ready to learn Tarot? 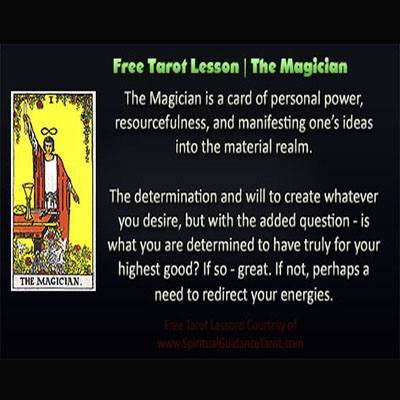 Be sure to bookmark the Learn Tarot page for a full list of free lessons. If you haven’t started at the beginning yet; be sure to check the information for creating your Tarot journal. It is the most effective way to learn Tarot for yourself in a way that makes sense for you. The Magician represents someone who is working to consciously manifest his dreams and desires. He has the elements on the altar before him. One hand with the wand points to the sky and the other hand points to the ground. It is bringing spirit and the material realm together, consciously directing your energy to manifest your dreams. This is also a card of resourcefulness, learning to use what we have to meet our needs. It also speaks of being proactive and having good problem-solving skills. Magician is someone who knows what they desire and will stop at nothing to attain that desire – for better or worse. Be sure that the goals you are pursuing are truly for your highest good. Themes are personal power, directing of one’s energy, resourcefulness, determination, and will.